Here's a favor that is guaranteed to make your guests reflect on the happy memories of your special day! 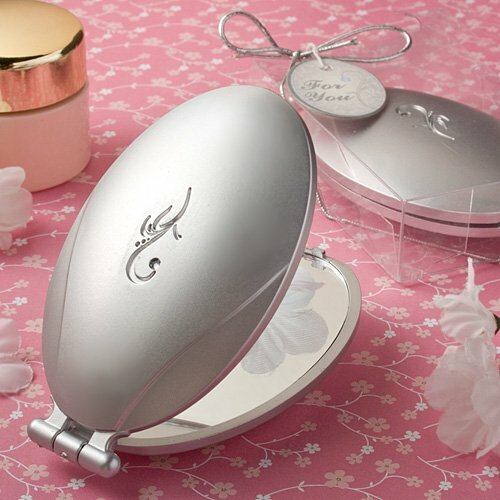 Each oval compact favor, from Fashioncraft's exclusive Classy Compacts Collection, measures 3" long x 2" wide and has a pretty silver matte finish molded plastic outer case, brilliantly detailed with a rhinestone accented central carved flourish design, with a hinge that opens to reveal dual glass mirrors inside. A distinctively feminine choice for bridal showers, Sweet Sixteens, girls' night out and more, each comes in a clear acetate box, wrapped and tied with a silver metallic elastic cord and an attached purse design "For You" tag.